Let’s run through the types of basic Skin Surgery in order of Cost & Simplicity. The spray-gun is a common sight at skin cancer clinics! Cryotherapy is freezing treatment & often used in the skin cancer clinic. The temperate of Liquid nitrogen is -195.6°C. The skin cells are damaged both during the freezing treatment itself and the thaw. Different types of skin cell and skin cancer cell are killed at different temperatures. The lesion freezes from the centre outwards. The skin directly under the targeted area is frozen at a deeper level than the skin at the edge of the frozen area. How do does the skin cancer doctor know deep the freeze is going? By looking at the ice circle on the surface – the wider the ice circle, the deeper will be the freeze. What affects the amount of tissue frozen? As you can see, technique is important. It looks simple but the technique does involve attention to detail. Discomfort or pain – for longer freeze times, or treatment of sites that are more tender (especially the ear). When pain occurs, it’s usually during the thawing stage. Soreness, Redness, Blister, Crusting, Swelling. Blisters are best left intact. Scabs should not be removed as they help to protect the healing wound and will fall off after a few weeks. Pigmentation after the procedure: usually loss of pigment but there may be increased pigment on occasion. Uncommonly, the pigmentation is permanent. Also you could add wound recovery time for long freezes required for skin cancer: a month or more – the long freeze required for skin cancers such as BCC or IEC is not an “easy” option. Why has my skin gone pale after Cryotherapy? Different types of skin cancer cells are killed at different temperatures. Melanocytes are the pigment-carrying skin cells. Unfortunately, melanocytes are killed at lower temperatures than most other types of skin cell including all the types of cell which are being targeted during cryotherapy. Therefore, pale patches are common after cryotherapy. There is an argument that cryotherapy that does not kill melanocytes (with loss of skin pigment) is unlikely to be doing much good. Quick to perform, multiple Solar Keratoses can be treated at the same time. Cryotherapy is quick to perform and therefore does not require an additional appointment. The resulting scar tends to be better than surgical excision. No Pathology Sample & Pathology is may be required for confirmation. Cryotherapy is only suitable for two types of skin cancer: IEC & BCC. Longer freezes required with a recovery time of a month or so. Skin cancer recurrence rate usually higher compared with surgery. Often performed during a skin check. Shave Excision is performed under local anaesthetic and is a method taking a superficial skin biopsy without the requirement for sutures. Shave Biopsy is probably the most commonly performed type of skin biopsy to establish a diagnosis of skin cancer. No sutures are involved, and it generally gives good pathology samples for most superficial skin lesions. A type of razor- blade cuts through the upper layer of skin that approximates to the the epidermis and upper dermis. A shave gives a better sample for the pathologist but does not allow for the “feel” of a curettage procedure (during curettage, the demarcation point between healthy and cancerous skin can be felt). So the decision to curet or shave a lesion will depend on the clinical certainty of the diagnosis using dermatoscopy. The cosmetic outcome of a superficial shave is normally good – similar to the outcome of a curettage procedure. Local anaesthetic is used before the blade is applied. 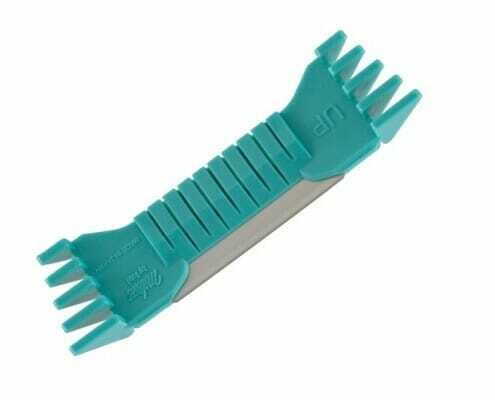 The shave instrument is a disposable sterile surgical blade that allows skin to be cut through horizontally. When is Shave Excision used? Surgical removal of a Suspected superficial non-melanoma skin cancer (superficial BCC or IEC) may be perform by a shave excision or curettage with cautery. There are a range of benign lesions that may be removed with a shave excision, although some types of lesion are more likely to grow back than others. Curettage (with cautery) may be a better option for some lesions such as pyogenic granuloma. What is a Deep Shave Biopsy? Another type of shave biopsy is a deep shave biopsy – also called a saucerisation biopsy. This type of shave excision takes a deeper out a deeper layer of skin (well into the dermis) – and is therefore used when a deeper layer of skin will be required by the pathologist. A saucerisation biopsy will leave a more pronounced scar than a superficial shave. A saucerisation biopsy is an alternative to formal surgical excision in the management of some pigmented skin lesions. Australian and International Guidelines do emphasise that formal surgical excision is generally the better option for initial sampling of a melanoma. There are situations where a shave sample of a possible melanoma might be considered because guidelines cannot cover every scenario. As with a formal surgical excision, risks are infection, bleeding and scarring. The degree of scarring, will depend on how deep the shave is performed, and factors such as age, location and physical activities. A saucerisation biopsy on the back of a physically active male is like take weeks to heal and is likely to scar significantly. A deep shave taken over the shoulders or front of the chest are most likely to cause a hypertrophic or keloid scar. Shave excision below the knee in older people may take a long time to heal. The main way of both sampling and treating a superficial skin cancer at the same time. In dermatological surgery, Curettage is a method of removing lesions using a curet. Curettage is a widely used method of both treating and sampling superficial skin cancers with minimal scarring. 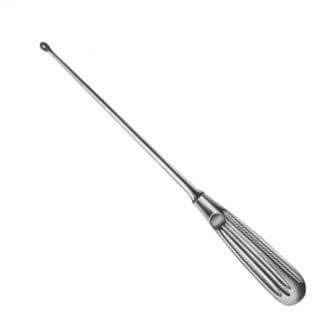 A curet is a sterile surgical instrument with a curved ending that allows a lesion to be scraped out. The cosmetic outcome is similar to that of a shave excision. A curet allows a lesion to be scraped out by “feel” whereas a shave involves a flat cut along the base of the lesion. What is Curettage used for? Treatment of suspected or known superficial skin cancers (Superficial Basal Cell Carcinoma & Intraepithelial Carcinoma), and Hypertrophic or thickened Solar Keratosis. The advantage of curettage over a shave biopsy is that curettage allows a superficial skin cancer to be treated by “feel” rather than blindly as with a shave. On the other hand, skin that has been sampled with curettage consists of lots of tiny fragments of tissue. Therefore, the pathology report may not be as definitive or precise as it is for a single sample taken via a shave biopsy. What are the risks of Curettage? Curettage & Cautery is generally considered a low-risk procedure. The risks, though small, are the same as the risks of a formal surgical excision. It is not always possible to know in advance how deep the curettage procedure will need to be. Deeper procedures will leave a more prominent scar. Smaller and/or superficial curettage procedures typically leave small scars. Used to Apple Core a lesion. Punch Biopsy samples the full depth of skin. A Punch biopsy is a great way to take a sample of a large lesion or unusual skin rash. A surgical instrument called a punch biopsy is used to remove a “core” of skin. Local anaesthetic is injected before the punch instrument is applied. Punch biopsies vary in diameter from 2mm to 8mm. A 2mm is suitable perhaps for an eyelid whereas a 3-4mm punch or more is typically preferred for skin cancer biopsy purposes. A complete small skin lesion (including a rim of normal skin called the margin) may be removed with an 8mm punch. No suture is necessary for the smallest punch biopsies. An 8mm punch biopsy will require 2 to 3 sutures. The most common size used is a 4-5mm punch biopsy which will usually require a single suture. When is Punch Biopsy Used? What are the risks of a punch biopsy? 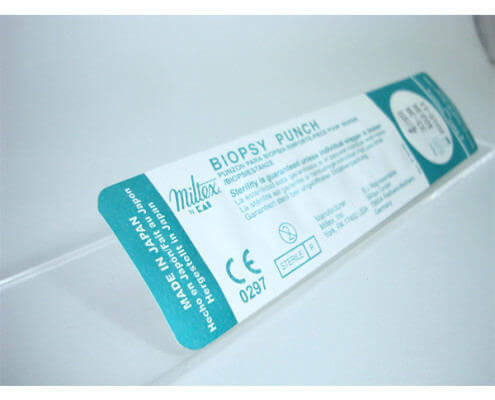 Punch biopsy is generally considered a low-risk procedure. There is a risk of bleeding, and damage to underlying structures is a recognised but uncommon complication (e.g. nerve damage). These risks are small to extremely small. 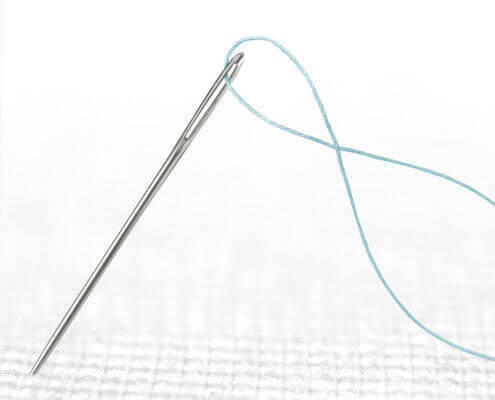 ‘Cut and Stitch’ is required for any type of deep skin cancer. Sutures are required after surgical excision. What is Formal Surgical Excision? A formal surgical excision is commonly performed in the skin cancer clinic as a way to both remove and treat a suspected lesion. Surgical Excision provides the best possible full-thickness skin sample for the pathologist to work with. This method is usually the best way to diagnose a suspected melanoma. Is the objective to do a single curative procedure at the same time as confirming the diagnosis? Examples are removal of a BCC or SCC which are identified by dermatoscopy. Or is the objective simply to get a sample, in which case other methods of biopsy may be more suitable such as punch biopsy or shave biopsy. Pigmented skin lesions (possible melanoma) are generally biopsied with a formal surgical excision. The cutting of a a standard formal surgical excision is in a diamond shape. The procedure is sterile procedure & performed under local anaesthetic. Flaps and grafts require a higher level of surgical training and are carried out by some skin cancer doctors, some Dermatologists, and of course plastic surgeons. The question is really – what is the length of the scar? For a standard excision, imagine a circle drawn around the lesion. This circle must include a margin of normal skin either side of the lesion (the margin is usually 2-4mm but may be considerably greater). Now measure the width (diameter) across this circle and multiple this figure by 3 to get the approximate length of scar. For example, consider a lesion measuring 8mm across that is removed with margins of an additional 2mm either side. The total width of the skin to be removed is 8mm (the lesion itself) + 2mm (margin of skin one side) + 2mm (margin of skin the other side) = a diameter of 12mm across. The length of the scar will be approximately 3 x the diameter. In this example, 3 x 12mm = approximately a 36mm length scar. So you can see how a small lesion (8mm) leaves a much longer scar (around 3.5cm). This often comes as a surprise. The scar may be a little shorter or longer depending on factors such as the movement of the skin. What are the risks of surgical excision? Longer term risks: Hypertrophic scar is excessive but normal scar tissue. Keloid scar is scar tissue that continues to grow outside the wound edge. Keloid is most likely to occur on the front of chest, shoulders, ear lobes. Some people are genetically prone to keloid scarring. Keloid is more common in Asian, Black & Hispanic people. There are risks to everything medical (almost) – and doing nothing is rarely an option with skin cancer. However, there may other surgical or topical treatments that are appropriate, and these options should be discussed. However, it’s usually pretty clear when a skin cancer is is best removed in its entirety. The face heals quickly and early removal of sutures will reduce risk of suture scars. The lower legs need the longest time before removal of suture because of the tension of the skin in that area and the movement to be expected with day to day activities. The wound is only at 10% of final strength at 2 weeks, and 50% at 4 weeks. Healing wounds are delicate and need to be respected! The key is to keep it covered until the removal of the sutures. It’s proven that moist wounds heal faster and better than dry wounds. The old adage of “getting air to the wound” is not appropriate! Typically, a clean dry dressing may be put on and replaced when required until suture removal. It’s a good idea not to over-do the physical activities soon after the procedure, particularly for complex closures or excisions on the limbs or back. Come to an agreement with your doctor and stick to it! After the sutures are removed, it is proven that “taping” the wound for up to 3 months reduces scarring. This is particularly important in areas where the scars tend to spread over time eg the back. How do you tape the wound? Just use steristrips or fixomull tape from the pharmacy, cut to size and put over the wound. Fixomull is a breathable fabric that sticks to skin that you can buy from a pharmacy. You are welcome to make an appointment at our Cleveland skin cancer clinic, Brisbane Bayside.